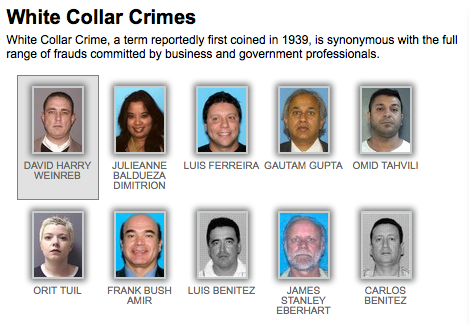 Why isn't Jamie Dimon on this Most Wanted poster? The Administration finally released the HUD Inspector General Reports that consist of the only investigation of foreclosure fraud conducted as part of the foreclosure settlement. I’ll probably have more to say about the reports tomorrow. But here’s a hint. The Wells Fargo report describes WF management refusing almost all cooperation. Wells Fargo provided a list of 14 affidavit signers and notaries and then initially restricted our access to interview them. Wells Fargo attorneys interviewed them first and then only allowed us to interview 5 of the 14 affidavit signers. Wells Fargo told us that we could not interview the others because they had reported questionable affidavit signing or notarizing practices when it interviewed them. After discussion with attorneys for Wells Fargo and OIG counsel, terms were agreed to, permitting us to interview these remaining nine persons. The terms that Wells Fargo set required that Wells Fargo management and attorneys attend all of the interviews as facilitators. This condition resulted in delays and may have limited the effectiveness of those interviews. Wells Fargo’s terms also required that persons we interviewed have private counsel present on their behalf. Wells Fargo chose the private counsel and paid the attorney fees of the persons we interviewed. Wells Fargo was not timely in arranging the private attorneys, which further delayed our interviews. And it concludes that WF may have have violated the False Claims Act. In other words, the government has been sitting on evidence of significant crime for the last 18 months–crime that resulted in people losing their homes and the government being defrauded. The government just gave the banks a Get Out of Jail Free Card for those crimes. Mortgage fraud: During 2011, mortgage origination loans were at their lowest levels since 2001, partially due to tighter underwriting standards, while foreclosures and delinquencies have skyrocketed over the past few years. So, distressed homeowner fraud has replaced loan origination fraud as the number one mortgage fraud threat in many FBI offices. Other schemes include illegal property flipping, equity skimming, loan modification schemes, and builder bailout/condo conversion. During FY 2011, we had 2,691 pending mortgage fraud cases. Financial institution fraud: Investigations in this area focused on insider fraud (embezzlement and misapplication), check fraud, counterfeit negotiable instruments, check kiting, and fraud contributing to the failure of financial institutions. The FBI has been especially busy with that last one—in FY 2010, 157 banks failed, the highest number since 181 financial institutions closed in 1992 at the height of the savings and loan crisis. Distressed homeowner fraud, property flipping, and check kiting. That’s what the FBI has been looking at during the entire period when DOJ has just been sitting on this evidence of much greater, more destructive fraud. Yes the govt. release the results and there will be a lot of talking heads explaining that something really big is coming then ) wins and it all goes dark. Thanks for this report, EW. The perverted sense of justice on display in your report is disgusting. And if I remember correctly EW, we all wondered at the time why the lawsuits by the FHFA didn’t include Wells Fargo. Can you say the criminal banksters are in bed with the law enforcement authorities? Nothing but blowjobs for all? I thought you could. …Toward the end of the hearing, the three judges and the CIA’s lawyer recessed for a 40-minute classified session to discuss the documents we are seeking. When the public hearing resumed, the CIA’s lawyer made the mystifying claim that the CIA “does not concede or not concede” that waterboarding is illegal. My mental facilities must be failing, or I must be confused…but I am sure I did see an interview where President Obama said the reason there had been no prosecutions is bacause no laws were broken…maybe it is that due process thing working out differently for bankers than for medical pot users. @MadDog: Waterboarding illegal? Who knew? He gets a lot more in donations from banksters than from medical mj users. Follow the money, as usual. If we know the DOJ knew about these crimes but got nothing in return for absolving the banks of the crimes (like bigger names to prosecute–more little fish to fry does not count), then it is too bad that we cannot indict them for obstruction of justice. Actually the story will be continued over the next few days and weeks. I made it to not only the OCC but also FTC, CFPB multiple Attorney Generals Offices etc.. Still hard at work trying to get the SEC to work with me and let me explain to them the evidence I handed over (I went to NY and knocked on their door and made an attorney from their enforcement division sign accepting the evidence). People need to contact their Attorney Generals and have them contact me. Several I have already communicated with including NY they need to move it along more people are impacted every day. Well, I certainly hope some or any of these investigations takes hold and breaks apart the bankster icebergs covering and relentlessly destroying the good ‘ole USA (and world). Ms. Almonte’s request to get our Attorney Generals involved sounds optimistic. I wish she would write more about what we citizens can do right now. Let there be sunlight and heated investigations. What this means is that the WH theme of “we didn’t know” is still just so much hogwash. They could claim ignorance by rushing to the agreement before the SF report came out, but not this one. Really? The judge allowed this? am i mistaken, or are most of the names with the photos on the left of your column “foreign”. it would, in my view, add a whole new dimension of amorality to barack obama’s presidential persona. Matt Taibbi has several new columns out recently on the mortgage crisis, one exposing the crimes of JP Morgan Chase (“J.P. Morgan Chase’s Ugly Family Secrets Revealed,” March 13, 9:18 AM ET), and the other on the Bank of America (“Bank of America: Too Crooked to Fail“, March 14. But the most devastating may be Goldman Executive Greg Smith’s Brave Departure (March 14) along with his op-ed piece in the NYT. This is because people invested in GS may just decide to take their money elsewhere, instead of being treated as sheep to be fleeced by Goldman Sachs. Besides the Op-Ed piece by Smith, we have also the report by Carl Levin. So, while GS tries to belittle Smith, there is plenty of evidence from other sources to validate what he is saying.